I’m doing two things right now that feel a little… strange. One is that I’m spending days on end by the bedside of my dying grandmother, holding her hand and carefully watching her body shut down. The other is that I’m writing about it in real-time. On the Internet. My grandmother, Sarah “Sally” Dopp (they gave me her name but not her nickname) is going to die soon. The fact that she hasn’t yet is shocking. She’s come really close. Twice. I was flooded with messages. More sites to check, tips on how to approach and talk to airlines at the last minute, offers of frequent flier miles, specific research on possible flights, offers to help raise funds to pay for the expensive last minute ticket, ideas for other airports I could fly into, echoes to broader networks of people, and messages of love and support. A few people even started calling airlines on my behalf, asking which flights were already booked and what my other options were. A dear friend got to my apartment as soon as she could and drove me to the airport. I spent the ride checking messages and calling people, trying to narrow down what airline would be the most likely solution. For each possible flight someone had found for me, I only had a window of 15-30 minutes to buy the ticket and board the plane. I ran. I got a direct flight. It landed me in Boston at 10:25pm. I would not have gotten there on Friday without your help. I spent the flight holding onto as much calmness as possible, preparing for the likelihood that she’d be dead before I landed. An East coast friend who also saw my twitter-panic came to get me at the airport. I got my mother on the phone the second I saw him. “She’s still alive. You’re going to make it. Drive safely.” I collapsed onto my friend’s shoulder and cried until I could walk again. Twitter breathed a sigh of relief along with me. I arrived to find the rest of my family camped out in the hospital room with an impressive spread of snacks (“We’re gonna be here all night”), standing around my grandmother, holding her hands and each other. My family asked how I managed to get there, and I explained how “My friends on the Internet found me a flight.” They shook their heads the way you do when you witness a miracle and are too tired to talk about it. The last chunk of family would be arriving from Florida in half an hour. We all made it. I went straight to her, touched her face, and said, “I’m here. Sarah’s here.” She opened here eyes and stared at me in a morphine haze. “I flew from San Francisco to see you. I’m here. You’re beautiful. I’m here.” She stared at me with her mouth relaxed, half-open, and wiggled her tongue. I kept talking for a few minutes until she closed her eyelids again. Someone put a hand on my shoulder and said she’d been unresponsive all day, and hadn’t opened her eyes in a long time. Saturday and Sunday passed with me standing guard as diligently as possible. I took naps every six or eight hours and mostly focused on holding up the night shift — those hours the rest of my family who’d been caring for her for months needed to rest. My grandmother had told my uncle a few weeks ago that she didn’t want to be alone when she died. We promised her someone would always be with her. We’ve been doing that. For those hours when I’ve been the only one in the family awake, I’ve kept my phone near me and read the messages I’ve been receiving. Twitter, text messages, blog comments, facebook notes, email… They ground me and give me strength. My family is so exhausted, and I can get support without needing to lean on them. From dozens of people. In the middle of the night. Without having to speak. And without letting go of my grandmother’s hand. We’re watching her breathing and her facial expressions. When she starts flinching, we give her extra shots of morphine. She’s opened her eyes a few more times and we’ve used those chances to name everyone who’s here and tell her it’s okay to let go. My mother is a minister. My brother is a licensed nursing assistant. We’re a tiny family, but we’re taking care of her well, and we’re trying to take care of each other. Late last night when I was the only one awake, fluid started to fill her lungs, her breathing turned to deep gurgles, and her skin started turning purple. The nurse explained that she’s getting closer, and that her last breaths may be a choking episode. I called my family in and we stood around her bedside, holding her as gruesome things started to take over of her body. We held her there for hours. Prayed. Sang. Cried. It got worse. And she still didn’t die. As I write this, it’s been twelve hours since I made those calls to my family, and she’s still going. I started to snap — too much caretaking on not enough sleep wore me out deeply, and then seeing her body start to turn into something out of a horror movie put me over the edge. I became nauseous, had trouble breathing, couldn’t speak. My mother ordered me to take a break. So right now I’m at my aunt’s house, resting, and processing experience by blogging it. Because that’s where my stability is. In the documentation. And in the hundreds of messages of support I receive because I’m able to do it publicly. Sometimes social media doesn’t make sense to me. Today it does. Thank you for being there. 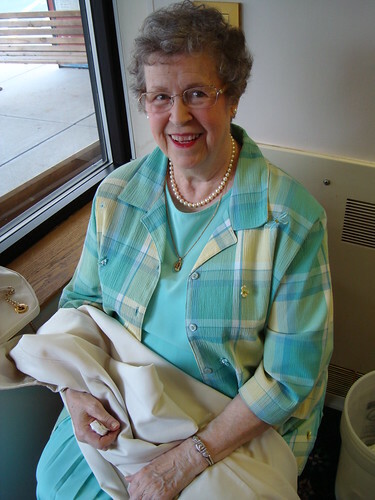 Edit: Grandma Sally died July 29, 2008 at 3am Eastern time, about 12 hours after I wrote this post. it always stuns me how long it takes, and the incredible strength that holds on. and then something tiny, like changing linen, just knocks it off balance and it just stops. your family sounds like you’re doing it just like mine did, and it’s such a gift. and then, in awhile, you will be there to talk someone else through the same thing. it’s how it al works. e, your messages have been grounding and helpful. i’m so glad you’ve been here and can tell me about it. thankyou. I cannot say enough how awed I am by the way you’ve been sharing this. Thank you for that. I wish you, your family, and especially your grandmother much peace. Twitter and blogs provide an amazing network of strength, hope and friendship. I’m so glad you made it to see her; she truly was a beautiful lady. Now following you on Twitter. Best wishes for you and your family during this difficult time. Sarah, you always awe and inspire me. I am so proud of you for taking the time to go be with your grandmother as she moves from this life to the next. I used to be proud that I wrote my grandma a great letter before she died in hospice. I heard stories that she would show it around her pre-hospice living center with pride. But, in the end I chickened out and didn’t make time to be with her as she left. You are doing an awesome, generous, and strong thing. I wish you boundless energy and comfort. I’m so glad you made it across the country to be with her (and I’m sure she and the rest of your family are grateful too). This is hard on everyone, but you’re doing a great job of processing it all. I’m waving pompoms for you and your family to make it through all of this. maybe for the first time in the years I have known you, I have fully realized just how awesome you really are. I’m sending as much support as I can muster, and if you want to call, I’ll answer. You really are an inspiration, and your grandmother must be proud. Sarah, I have been thinking of you and Sally and your family … and I have been remembering my father and my mother and my grandpa and granddad and nana. You are in my thoughts during this difficult time. I dealt with the same thing with my Grandma… they kept saying “anytime now”. That “anytime now” turned into 7 long days of watching her labored breathing and unconscious response to what was going on around her. The waiting is hard… you don’t want her to go, but you do. I totally and completely understand. May she go in peace and may you find peace in knowing that you spent her final moments by her side. I’m so glad you made it in time. When my grandmother died, I didn’t get to be there even though I had a lot less far to go and I’ve alway deeply regretted that. So you made it and you’re there and that’s a very good thing. This post made me cry, but in a good way. Tears of happiness that you have a family and a network and support to get through this, and that your grandma has loving family watching over her and needn’t go away alone. Commenting to say I’m glad I read this story, and that I’m thinking of you and your family. It’s really a sacred thing to be present for someone as she begins or ends her life. How wonderful that your internet community helps hold you up in turn. Blessed be. I’ve been following along and just wanted to let you know my thoughts are with you and your family. You’re loved Sarah. Your love for your family and your Grandma is sent back to you 1000 times 1000. To help someone have a good, supported death is really difficult…especially in this country. It takes courage and commitment and deep, deep love. I drafted this comment last night and woke up to the news that your grandma died. Glad we could all help a bit, and thank you for sharing this very personal and important story with us. Peace to you. Sarah, your post brought tears to my eyes. I’m so glad you were able to be there with your grandmother and family. Sending good thoughts your way. I’m so sorry, Sarah. Finally your grandmother has made the transition into whatever lies beyond this mortal world. Sending you love. Sad for the news, though suffering is done on her side of it. My less-detailed blog (and no twitter needed for a “couple hours of bussing” version) was with my Mom a couple years ago; I understand a few similar levels of the net-support you feel. eHugs-o’-support! Sending my love to you – your grandma sounds like a one of a kind lady! Sorry to read about your recent loss. Sending you and yours all the best from Scotland.